Well today is the last of the 2018 SpringWatch series and I have loved every minute. I’ve adored reading all the comments and chatting to you all. It’s been a humble privilege to welcome so many of you as brand new customers and loads of new demonstrators to my team. So I’m ending with a pretty stunning box of a size I can’t recall ever making…. This one is a 4″ cube (10cm) and the lid is reinforced on the sides. Got to love that haven’t you! I’m so happy with how it turned out and I don’t think it needs very much extra in terms of embellishment. The paper is stunning enough to stand up by itself with just a bow and a little die cutting. Just make sure you check your die cut shapes haven’t fallen on the floor during the video…. Oops! So did you enjoy SpringWatch? Do you have a favourite tutorial? I’d love to know. Score on ALL sides at 1.5 AND 4″ (4 AND 10cm) BUT please do follow my video tip to make sure you get a snug fit rather than a tight/no fit lid….! Stampin up has guided me to some of the most beautiful boxes. Now I need to find the perfect things to go into them………..
I’ve loved this year’s Spring watch, all projects have been great. Really like today’s project especially when you destroyed the flower but just laughed and carried out. I don’t want Spring Watch to ever end! I have loved seeing your beautiful daily projects Sam! Thank you so much for all of them. You have inspired me! Really like this box and the papers are lovely. Another great project love the papers you used really good size box and as always you make it look so easy and pretty. Thanks so much for all the time you’ve spent on all your projects giving all of us loads of inspiration. Great project with lovely colours! You never fail to deliver fun ideas with such flair, you make us feel we can all be experts. But there is only one Sam , so thank you for everything you do to inspire your loyal followers. Spring watch may be over but I know you will continue to delight us…..
A lovely big box in a lovely colour on the last day of your awesome Springwatch 2018. My favorite is the bag-in-a-box. Thank you Sam for all the inspiration and great tutorials. 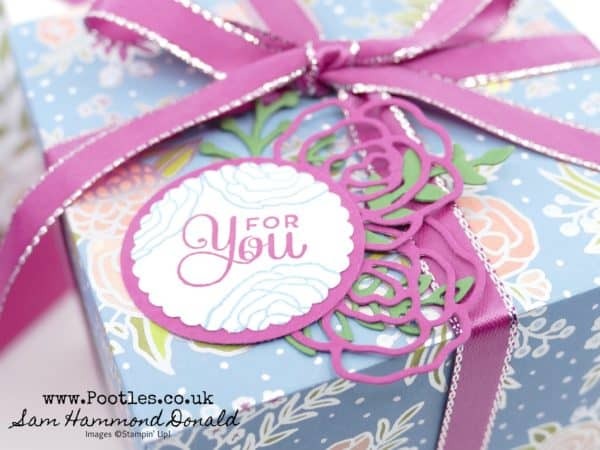 Lovely box made one recently but in different cardstock but I love your colour combination. I adore this paper. Thanks for all your Springwatch project. Is it the last one already! I loved seeing all you your projects. Lovely large box. The whole two weeks have been great – lots of ideas to make use of in the future. Made me laugh in early am. Love the box and DSP you used. Thank you for sharing. Have really enjoyed the SpringWatch tutorials, your ideas are always beautiful, creative and inspirational. Love the fact that you share you knowledge and tips to help me improve my own papercrafting skills. I think you saved the best for last. Beautiful box. I think I love this box most from Springwatch, it’s beautiful. I truly enjoy all of your videos, your instructions are so easy to follow! I gave you a mention at our recent team meeting when i did a little demo based on the tiny treat box for the hearts candies. You are my inspiration, thanks Sam! Have loved all the projects for Spring Watch and so enjoy watching you making these projects. You are so good about sharing ALL of your tips and tricks and lovely items you make. You are so talented, thanks for all you do. A beautiful box. Great inspiration in each and everyone of your posts. When’s the next occasion for a video marathon. Springwatch has been great. Lovely sized box! Fabulous box; I’m off to have a go right now! 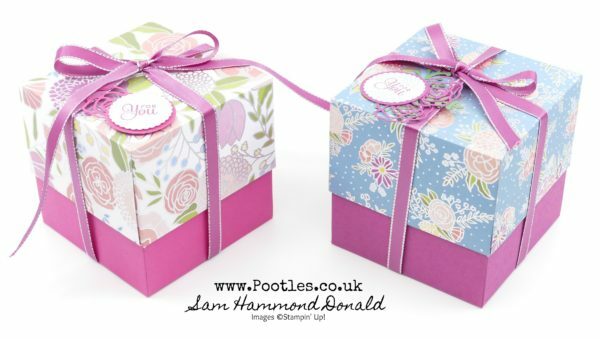 What a lovely and very good sized box – Made in paperheaven (by Sam…)! What a lovely box , Thank you for sharing. Have a nice Sunday Sam. Greetings from Canada Sam!! I had a good laugh with that flower bit. Thanks for all the great videos. I must say I have made every one of your boxes. Wow!! What a stunning box!! Love the colors you chose. Also glad to have a 4″ box. Argh! I only just found your Spring Watch today, totally loving what you’ve done. It’s really nice that you show your mistakes too Glad it’s not just me that makes them! Your instructions are nice and clear. It’s lovely to have some inspiration to make something other than a 2,4,6,8 box. This particular one is so pretty. I now have a pair of scissors that I keep just for ribbon as I too have had issues in the past. Have really enjoyed all of your creations and this one is brilliant even with the cute funny bits, when you thought you had cut right through the flower, then finding it after you had cut another. Have loved Spring Watch!! This box is just beautiful. Thanks for sharing your incredible talent!!! What a lovely box…. I made it today….and it just looks beautiful….!!! I really like the big cube box from today and Oliver's painted mother's flair milk carton but it's hard to make a choice because every projects were interesting. Thank you Sam for this nice adventure and for your big generosity. I'm looking forward for the next projects. wow, such a stunning box! I love the paper, the ribbon, all just gorgeous! This is a wonderful project. Love that the top is so secure and it’s such a great size. Thanks! I’ve loved Spring Watch, thanks for doing this. The more projects I can see the better. Hope this is the correct place to leave comments and enter the draw for the 4 inch box. I have made 2 orders in the last 2 weeks and hope this counts but in any case just wanted to say that it is not enough to have amazing ideas as you most certainly do; it is your teaching skills that also set you apart ( as a teacher I know what I am talking about!) -they are outstanding! To cap it all you have a charm all your own and I think you deserve all your success. Well done indeed. Love this box! The dsp lid makes this box pop! Thank you for all the ideas during your spring watch series! Lovely box and the DSP is beautiful; thank you for sharing! Have the watch winners been announced yet? Thankyou!